Jon Anderson: "Great to be back in Tampa Florida, quite unbelievable really. We just spent 6 weeks touring Europe, we come back and it's like, you guys are 10 times louder". And then the place went nuts !!! wow what a honor to be able to say,I was there!Will never ever forget that show!Saw the band at the Garden(TWICE) at RFK at THE SUN DOME at THE FAIRGROUNDS. And hope to see them 1 more time at the FORD AMPITHEATER IN JULY OR WHEN THEY RESCHEDULE!!!!!! 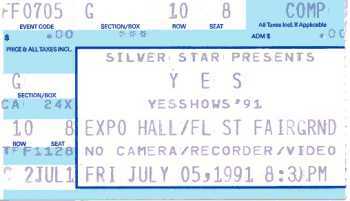 Another very interesting and delightful Yes production. I enjoyed watching the various members shifting around on almost every song. Good sound in what has been a nortoiously "bad" live venue. MYSELF AND MY WIFE DEBRA DROVE FROM THE BRONX TO ATTEND THIS SHOW.HAVING SEEN THIS SHOW 6 TIMES ON THIS TOUR, THIS VENUE WAS ONE OF MY FAVORITES.ANOTHER NIGHT IN THE ROUND.ACTUALY THIS WAS THE LAST TIME I SAW IN THE ROUNDBECAUSE JONES BEACH HAD A FLAT STAGE.MY BEST MEMORY WAS THE PEOPLE WHO WORKED THERE. 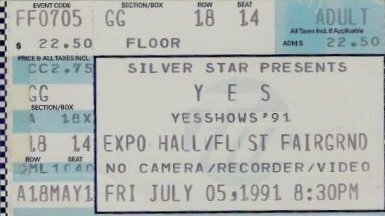 THEY GAVE US REFUNDED TIX BECASE WE LOST OURS ON THE BEACH AT CLEARWATER EARLIER THAT DAY.THE SPANISH GUITAR SOLO WAS SUPER AS WAS WAKEMANS SOLO AND AWAKEN.ANOTHER GREAT YES EXPERIENCE 1200 MILES AWAY FOM HOME.SEE YOU NEXT TIME. I had front-row seats for this show and the drum duet WAS NOT performed. I caught the Atlanta show four nights later, and they had added it back into the set by then.